In contrast to Day 2’s gruelling affair, Day 3 of the WTA Finals witnessed short matches in which the top seed Angelique Kerber and sixth seed Madison Keys had breezy wins. Kerber’s performance, especially, was noteworthy given she was facing an opponent as dangerous as the third seeded Simona Halep but the German defused the challenge with consummate ease, posting a 6-4, 6-2 win. Debutante Keys was equally impressive as she dismissed Dominika Cibulkova, 6-1, 6-4 in the day’s second match. For Kerber, who has never been past the group stage, her win would go miles to boost her confidence and to give a signal to others that she is very much ready to advance to the knock-outs this time. The Kerber vs Halep contest was deemed to be a must-watch match but it turned to be a pretty one-sided contest thanks to Kerber’s brilliance. It was Halep, though, who had an early break lead which she could not maintain once the World No. 1 found her groove. As the southpaw’s forehands started shining, Halep found her too hot to handle and she surrendered two service breaks to concede the first set. 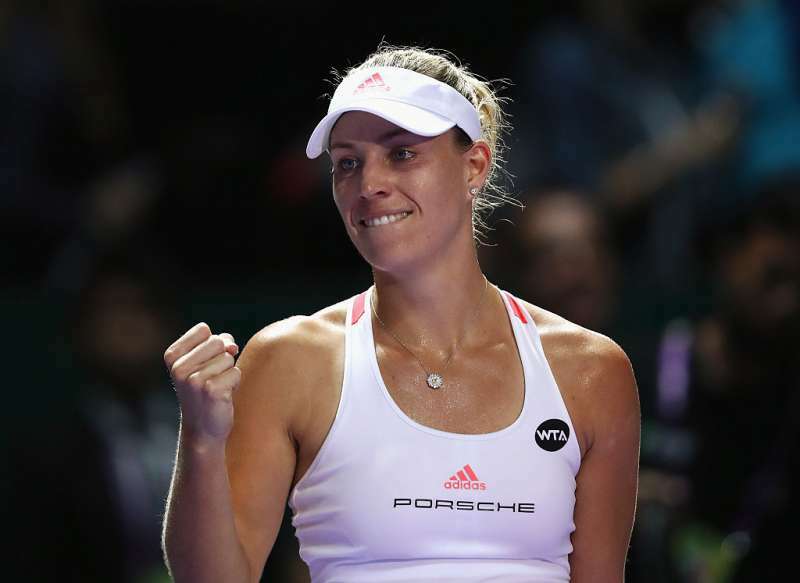 That only invigorated Kerber further. She was on song throughout the second set and committed just three unforced errors. The top seed broke the 2014 runner-up twice and denied the four break point opportunities the Romanian got to cruise to victory in 1 hour 22 minutes. Now all Kerber needs is a set from her next opponent – Madison Keys – to give herself a semi-final berth for the first time in her career. For the 21-year-old Keys, a first outing with the very best in the world would do a world of good to her career. Her campaign did not start the way she would have liked and she fell in straight sets to Simona Halep in her first match. But the way she rebounded from that loss to rout Cibulkova in just 1 hour 22 minutes, speaks volumes of the American’s maturity and her ability to bounce back from setbacks. With a flurry of stinging forehands, she grabbed her first break of the match to inch ahead 3-1 and there was no looking back. She struck once more to race through the opener, 6-1. The 2014 Australian Open runner-up kept it a competitive second set till 2-2 but Keys’ venomous forehands reappeared once again. The Slovak, who had lost all three of her previous matches to Keys, caved in once more under the barrage of the attacking shots from the youngster.